A continuation from the previous article. 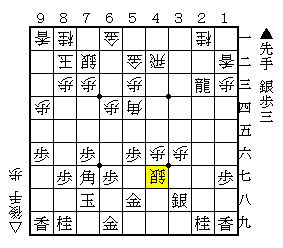 B*5d may look strange at a glance, but it serves as both attack and defense, watching the rook's head indirectly and aiming at a pawn with B*7f. Gote is expecting this bishop to work well. 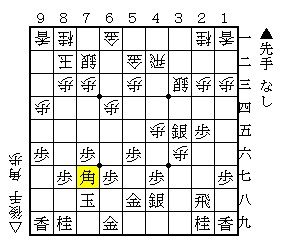 If sente attacks with P-2d against B*5d, it would proceed with Px2d, Sx2d, P-3g+ Sx3g, P*2g (Diag.2). In addition, instead of B*5d, P-6e is also selectable, which attempts to drop B*6d. The lance moves up to 1b in preparation for the attack from P-2d. After the silver is exchanged, the bishop on 7f cannot take the lance directly. The rook on 2d cannot take the knight in the next because the knight has been strung by the bishop. So, gote doesn't need to guard against Rx2d. Here, P*2h is the counterattack gote has been preparing for since B*5d. 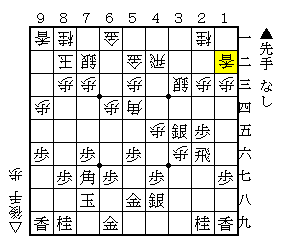 The sequence from P*2h is one of the characters of Yamada Joseki. 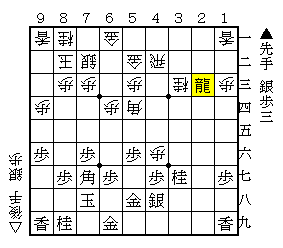 Sacrificing the pawns with P-4f and P-3g+, the bishop's path is opened clearly to 2nd file. And then it becomes possible to stop the rook's line with S*2g. When P-4f, promoting the rook to 2c is met by Px4g+, Sx4g, P*4f, S-3h, S*4g (Diag.6). Breaking the 4th file, gote is better. Instead of S*2g, P*2g is also considered. 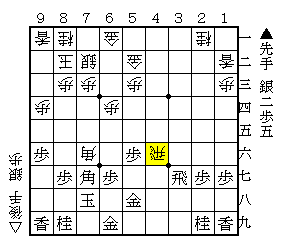 However, after R-4h, gote has no strong candidates to attack. If gote plays S*3i, it would proceed with S*3i, R-3h, P-2h+, Sx2h, Sx2h+, Rx2h Rx4f, S*5e (Diag.7). The bishop-rook fork with S*5e gives an advantage to sente. 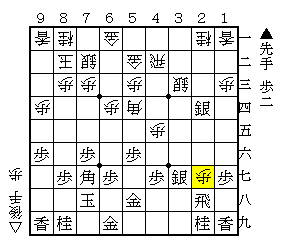 Dropping the pawn on 3f instead of P*3h, there would no subsequent attack after the silver run to 2f. On the other hand, sente is aiming at P*2h in the next. So, It's not a good move. In reply to P*3h, playing with P*2h, it will proceed with P-3i+, P*2g, Bx2g+ (Diag.9). 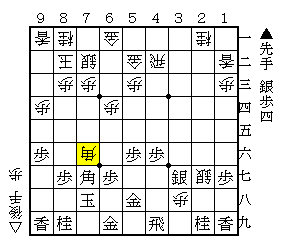 In spite of gaining a silver, gote has a little advantage because the horse and the tokin (promoted pawn) are strong pieces which can take the materials back immediately. Bx7f may look dangerous as sente would play P*2h, but, gote has the way to help the silver here. 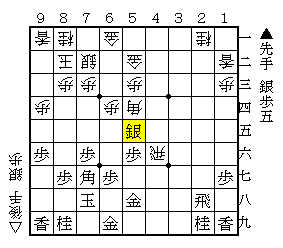 Using the pawn gote just took, the silver exchange is done by P-3i+, Rx3i, P*3f, Px2g, Px3g+, Rx3g. After the trade, as the silver is not on 3g, the rook can career off to 4g. 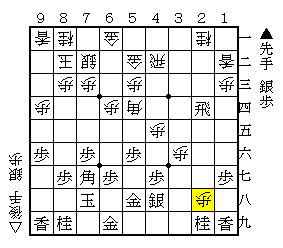 P*4f or S*4f will be played at Diag.10 to prevent the rook from invading. It's still an equal game. 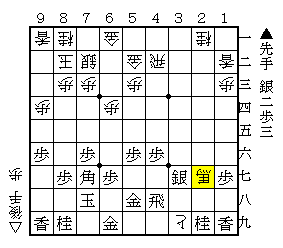 These lines are the mainstream in Yamada Joseki. If you have any questions, please ask me in the comment field. I will answer as much as possible. You're right. 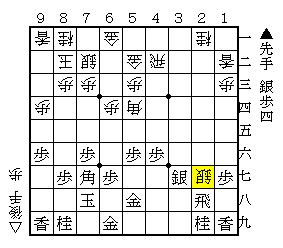 In that case, I suppose, in reply to △S-46, it's better to play positively like ▲P-45 △Bx33+ ▲Sx △Sx35 ▲S-44.